The Chinese praying mantis (Tenodera sinensis)—one of the strongest and probably the most widespread species of a praying mantis. It is endemic to Asia. Chinese mantis was first introduced in Philadelphia back in 1896, but the man did it accidentally. That is to say that the species wasn’t meant to thrive in Philadelphia but it probably did. Early scientists thought of Chinese mantis as a subspecies of Tenodera aridifolia e therefore they gave a taxonomical name of Tenodera aridifolia sinensis. Currently however the Chinese mantis has earned the full status of a species with the scientific name of Tenodera sinensis. The Chinese mantis is primarily recognized by its brown slender body. The mantis is comparatively longer with the length reaching at 11 cm (4.3 in). Some of the species display green color. It weighs up to 3 grams. The mantis rarely shows tan-color body. Chinese mantises have 4-cm long wingspan. As is typical of a mantis, the Chinese mantis can swivel its head 180 degrees. The intimidating eyes are rather prominent and their head is triangular in shape. The female is bigger than the male. The female mantis can reach the length of 10 cm as against the male’s size of 7 cm. Chinese mantises are probably the biggest of all North American mantises. The front wings are all brown but the border is lined with green lateral stripes. The Chinese mantis’ eyes aren’t exactly black they just appear to be one particularly in low light. The eyes are colorless one that matches the mantis’ head. They will resemble Tenodera angustipennis and narrow-winged mantid in appearance. Both these species are found in the United States. Chinese mantis has yellow legs. Chinese mantis is known to occur in Japan, Thailand, China, and Korean Peninsula. The ideal temperature of their habitat is around 20 to 38°C. The mantis is widespread all throughout the eastern United States as well as California. Chinese mantises have also been introduced in Australia. They are found in the Nearctic and Oriental regions. 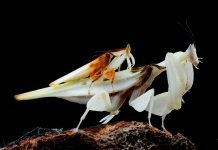 Chinese mantis is most likely to make homes in temperate habitats. The mantis’ habitat includes meadows, woodlands, grasslands, agricultural fields, streams, and rivers. The mantis likely lives in woody shrubs and herbaceous plants although it does spend time in flowers too. 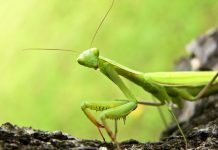 The Chinese praying mantis should have been referred to as a preying mantis (perhaps wrongfully) for it isn’t only highly aggressive, it’s also opportunistic. It can consume literally any insect that is about the size of a bug. 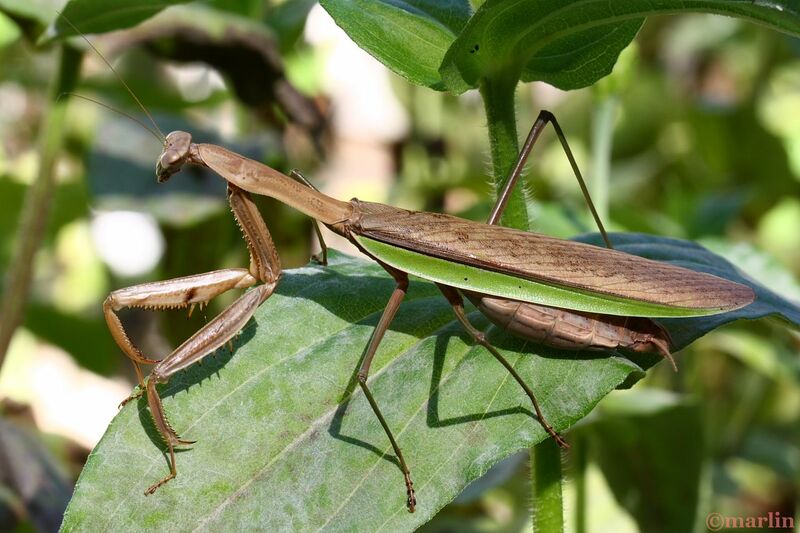 The Chinese mantis’ diet essentially consists of butterflies, spiders, cockroaches, grasshoppers, moths, and crickets. Before reaching adulthood, the mantis will rely on small flies such as Drosophila melanogaster. The adult mantis will however feed on small crickets, blue bottle flies, house flies, and other flying insects. Chinese are known to drink dew from the leaves therefore if you plan to raise them in captivity you must spray at least couple of times a day. The evening showers are probably necessary for them to thrive. Chinese praying mantises are formidable predators in that they rely on vision to take on their prey. They will also use olfaction to search some other prey. They are sit-and-wait predators just like owls. Mantis waits patiently on top of tall grasses to have a good view of the surroundings. As the prey gets within the striking distance the mantis grabs it using its folded arms. Chinese mantises are flightless insects except for the males that do know how to fly. Females do possess wings but they are completely flightless. They are highly active during the daylight hours. The Chinese mantis will establish a small territory of 4 sq. km. The first instar nymph doesn’t only have a slow growth—it’s also smaller in size in comparison to the second instar. The second instar eats more than the first. The female has a pair of reproductive glands that produces the protective material of ootheca. Since the mantis becomes all dormant in winter, the eggs must develop immediately after oviposition. During spring the Chinese mantis eggs hatch. The hatching period is about 45 days. Nymphs transform into an instar six to seven times before finally reaching adulthood. The nymphs develop their wings before they become adults. Chinese praying mantis is eating a cricket. The male will probably mate with the different females and vice versa. That is to say that the ootheca has more than one parent. Although the female fertilizes with multiple males she produces only one ootheca. 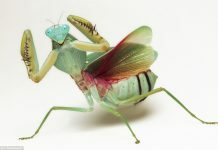 Male Chinese mantis can fly but females can’t. Thus the male has to do all the hard work of looking for their mating partner. The female releases pheromones that are sensed by the male from as long a distance as 100 miles. Male mantises ought to take a long flight. Males are more likely to attract to virgin females. In order to tempt males the female flexes its abdomen one that exposes its glands. Most of the times males go after the females either from behind or from the front. Females do not usually approach the male although they sometimes do. The female is most likely to eat the male sometimes during mating but mostly after copulation. But it happens typically when the female is too hungry and the prey is short. The female beheads its mating partner demonstrating absolute cannibalism. Sometimes males do know that they might get eaten by the female thus they can approach the female rather gradually from behind. Even so, males fancy choosing females that aren’t starving so they don’t become their prey. Males attain maturity at 180 days age. The breeding season ranges from late summer to early winter. The female produces 50 to as many as 600 eggs after a gestation period of 60 days. She will lay around 100 eggs in a single season. Chinese mantis has a fairly longer lifespan. They are thought to live 6 to 8 months in the natural habitat. They have varied lifespans primarily because the external environment plays a key role in determining the life expectancy. The adult mantis often dies in starvation. Chinese mantises have quite a few predators in the wild. 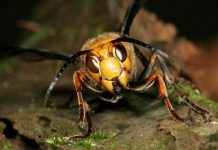 Prominent among their predators are Asian giant hornet, birds, primates, and other big praying mantises. Sometimes however one of the predators (hornet) becomes their prey. Duss, K.; Hurd, L E (1997). “Food limitation reduces body length in mantid nymphs, Tenodera sinensis Saussure (Mantodea: Mantidae): Implications for fitness” 99. Washington, etc. :Entomological Society of Washington. pp. 490–493. ISBN 0013-8797. Blatchley, Willis Stanley (1920). Orthoptera of northeastern America: with especial reference to the faunas of Indiana and Florida. The Nature Publishing Company. pp. 122–123. Watanabe, E., T. Adachi-Hagimori, K. Miura, M. Maxwell, Y. Ando, Y. Takematsu. 2011. Multiple Paternity Within Field-Collected Egg Cases of the Praying Mantid Tenodera aridifolia. Annals of the Entomological Society of America, 104/2: 348-352. Lelito, J., W. Brown. 2008. 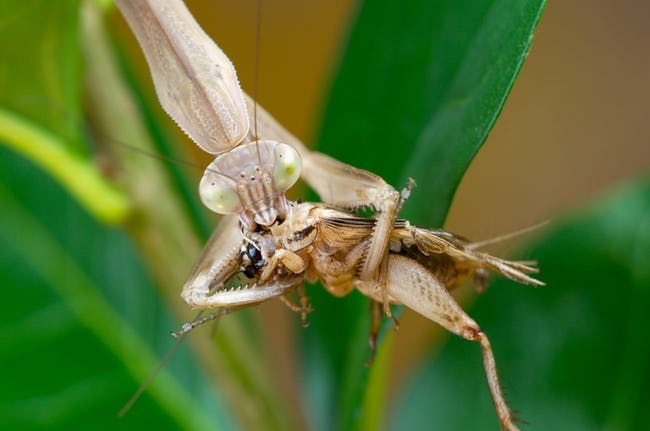 Mate attraction by females in a sexually cannibalistic praying mantis. 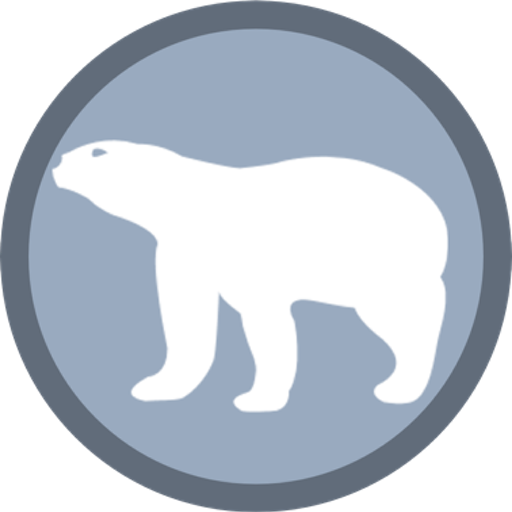 Behavioral Ecology and Sociobiology, 63/2: 313-320. Mazer, C. 2004. Chinese Mantid. Pp. 185-186 in M Hutchins, A Evans, J Jackson, D Kleiman, J Murphy, D Thony, eds. Grzimek’s Animal Life Encyclopedia, Vol. 3, 2 Edition. Detroit, MI: Gale Group. Balderrama, N., H. Maldonado. 1971. Habituation of deimatic response in the mantid (Stagmatoptera biocellata). Journal of Comparative and Physiological Psychology, 75: 98-106. Praying mantis is a wonderful-looking character with slender legs and intimidating bulging eyes. 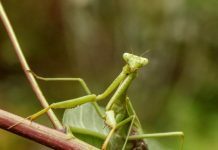 My mission is to update your current understanding of mantid biology related to their taxonomy, neurology, reproduction, growth cycle, and defense strategies. 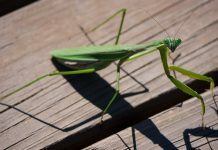 Praying Mantis Meaning – What does it Mean to See a Praying Mantis?